Seventeen i Sydafrika har intervjuat Josh och Liam Hemsworth har har lagt upp en liten förhandstitt på deras intervju på sin hemsida. Hela intervjun släpps i April. Läs utdraget nedan. In an interview with Seventeen, Liam Hemsworth and Josh Hutcherson told us more about their filming experience and what it feels like to be part of one of the most anticipated movies of the year! Lovely Liam wasn't shy to admit that he is super proud of his performance in the film. Liam plays Gale, the hot hunter. He shared: "I think as an actor, you always want your work to do well. I'm really happy with everything that I did in the film. And I think it was a bunch of people who ended up making this film and who really wanted to keep it close to the book. And if it does do well, then I think everyone will be very happy." Although he might play a tough guy in the movie, Liam isn't so sure of his real life hunting skills. "I think I might be able to catch a few rabbits [Laughs]. As for surviving and feeding a whole family, I think that'd be a very difficult thing to do. I think I could maybe survive a little while [Laughs]. Hopefully, I could feed myself at least!" 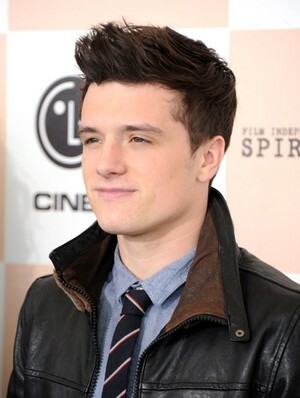 Yummy Josh Hutcherson says he had to do training to portray the role of Peeta. "I had to put on weight for the role, which was the biggest thing. I had to build up 15 pounds of muscle and that was done through working out a bunch and eating a lot of chicken and eggs and it was very tiring." Well Josh, the training definitely paid off! Josh also adds that the movie is about more than just fighting and violence. "The story is really about survival and it's about family and a tribute to freedom." Be sure to watch out for the April issue of seventeen for the full interview with Liam and Josh.